Gabriel Dawe working in his studio. Courtesy Amon Carter Museum of American Art. 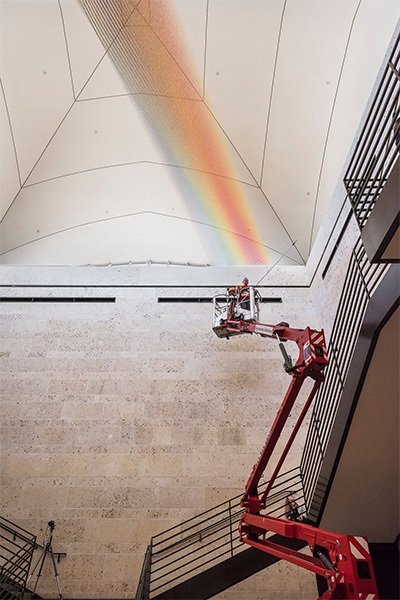 Gabriel Dawe installing Plexus no. 34 at the Amon Carter Museum of American Art. Courtesy Amon Carter Museum of Art. 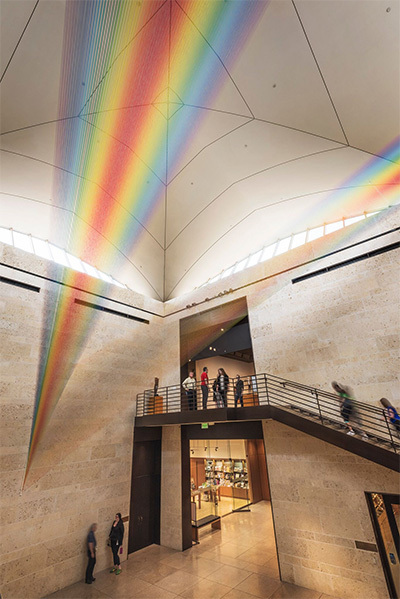 Gabriel Dawe spent two weeks in August scaling the Amon Carter Museum of American Art’s atrium, suspending one thread at a time. The exhibition, Gabriel Dawe: Plexus no. 34, is on view through Sept. 2, 2018. Using a custom tool that resembles a large needle, he threads from one wall to an opposing wall. Red, up and back. Yellow, up and back. Blue. And so it goes for 80 miles of thread. The result, Plexus No. 34, is a structure that catches the space’s light, turning it into a double rainbow. It will be one of the largest pieces in a body of work that has become a viral sensation for the Dallas-based artist. Dawe developed the series while earning his MFA at University of Texas at Dallas. After a period of burnout, he left a graphic design career in Montreal hoping to pursue his art. He dabbled on and off for a few years, returning to desk jobs when things weren’t proving profitable. He even returned to the original job he’d escaped from, which motivated him to return to school. Much of his art at the time was focused on textiles, embroidery and small-scale sculptural pieces made of deconstructed clothing. Even then, his work was time-consuming and exact. In one series, he pushed hundreds of pins into collars and shirt cuffs. In another, he explored insecurities about working in a domestic art traditionally dominated by women in his native Mexico. During an artist residency at CentralTrak in 2009, Charissa Terranova, director at the time, curated Transitive Pairings: Body Objects, in which she paired artists interested in fashion with architects. Dawe was paired with architect Gary “Corky” Cunningham. This first work in the Plexus series was more gradient than rainbow, but it hinted at things to come in Dawe’s intricate use of thread to make color. He and Cunningham created a structure that resembled the human eye. Cunningham designed a large eye structure for the outer wall of the gallery, connected to Dawe’s smaller “eye” at the center of the space. Since then, Dawe says the Plexus series has developed as both a conversation with the eye of the onlooker and with the space. Gabriel Dawe, Plexus no. 34, 2016 (detail), Gütermann thread, painted wood, and hooks. Courtesy the artist and Conduit Gallery. Dawe has had the opportunity to install these works in a smattering of rooms across the globe. 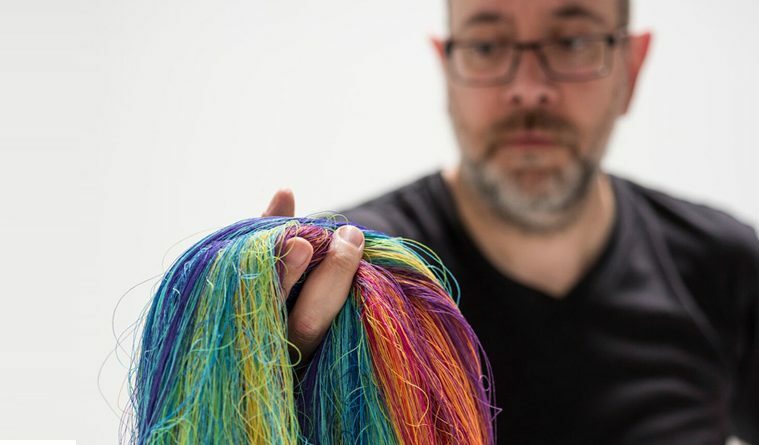 Iterations have been exhibited at the Renwick Gallery in the Smithsonian American Art Museum, and at the Miniartextil in Villa Olmo in Como, Italy. 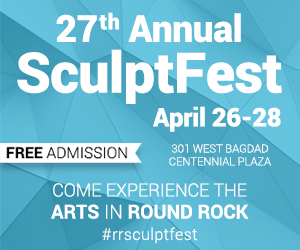 In Dallas he is represented by Conduit Gallery, where visitors can see his work on a regular basis. Which brings us to the Amon Carter. The atrium, which the museum uses primarily for installations by regional artists, was recently home to a large painting by folk artist Esther Pearl Watson. Now, Dawe has installed a double rainbow, which seems to pull light through the room. Draped from the ceiling, the color spectrum doubles in on itself with modest sewing threads encountering the eye in a visual alchemy. His magical thread is in demand. His calendar is booked solid in the months ahead, with works to be shown at the Amarillo Museum of Art, the Denver Art Museum, among others. 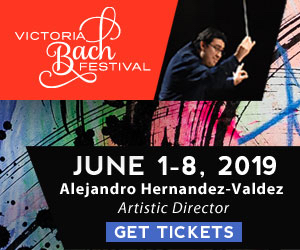 And while Dawe is thrilled to be working in concert with the color spectrum, he says in future work he’s thinking about interrupting the gradient. “I’m always trying to take liberties with or new ways to explore the color spectrum,” says Dawe. Color has given Dawe the independence to become a full time artist and now, it seems, Dawe is ready to test the boundaries of that freedom.